BroadSeis™ variable-depth streamer acquisition is a CGGVeritas solution for broadband marine seismic which uses a proprietary cable shape and a novel deghosting technique to remove the receiver ghost and extends the usable primary bandwidth up to six octaves. This solution benefits from towing streamers at depths of up to 50 meters, which, combined with the use of solid streamers, ensures the raw data has an exceptionally good signal-to-noise ratio, especially at low frequencies. It provides robust removal of the receiver ghost across the full bandwidth of the recorded primary energy using hydrophone sensors alone, yielding broad bandwidth wavelets without sidelobes for enhanced seismic interpretation and improved inversion results. The ability to record a full range of frequencies, low as well as high, is key to increasing the resolution of both the shallow and deeper parts of the seismic section. Broader bandwidths imply sharper wavelets with minimal sidelobes. These produce high resolution imaging of shallower features as well as providing deeper penetration for clear imaging of deep targets. However, with a conventional flat streamer configuration, recording this broadband spectrum presents a challenge. Although the low-frequency content can be improved by towing the streamer deeper, this causes the high frequencies (and sometimes the middle frequencies) to be limited by the receiver ghost notch. The frequency of this notch depends directly on the receiver depth, and is caused by interference between the upgoing, directly-reflected energy and the downgoing, ghost energy, reflected back to the streamer from the sea surface. Varying the receiver depth along the streamer creates receiver ghost notch diversity and extends the low-frequency end of the spectrum. CGGVeritas has designed a new deghosting algorithm, based on computing both a migration and a mirror migration (mirror migration is routinely used in ocean-bottom processing) and performing a joint deconvolution of the two. This can be performed either post-stack, where the method benefits from improved signal-to-noise, or on prestack image gathers. This method is both fully 3D, as it is performed in image space, and true amplitude, as it is able to extract the true deghosted reflectivity, i.e. the reflectivity that would have been obtained had the water surface not been reflecting. 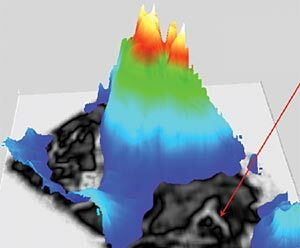 It provides a method of deghosting data acquired with a variable- depth streamer geometry that has been optimised to provide ghost notch diversity. This deghosting is both amplitude-preserving, and so AVO (Amplitude Versus Offset)-compliant, and fully 3D, making it fully compatible with full-azimuth or wide-azimuth data. The BroadSeis acquisition and processing solution has been employed extensively for commercial 2D and 3D surveys as well as for two wide-azimuth surveys. Combining the illumination benefits of wide-azimuth, long-offset acquisition with broad bandwidths provides the ideal solution for imaging beneath complex overburdens such as subsalt or sub-basalt. Reflection energy from the subsurface is recorded by the receivers (direct arrival) before continuing upwards to the water surface, where it is reflected back to the receivers and recorded as a “ghost” arrival. Using joint deconvolution after migration and mirror migration uses redundant information provided by the ghost itself to perform deghosting. The migration and mirror migration provide two different views of the reflectivity (Figure 1). After conventional migration, the upgoing primary energy is focused at the reflector position while the downgoing ghost energy is unfocused, appearing as a fuzzy, polarity reversed event after the reflector. Mirror migration treats the data as though they had been recorded at a mirror cable, positioned as far above the sea surface as the real cable is below. After mirror migration the down-going ghost energy is focused at the reflector position, while the up-going primary energy is unfocused and appears as a precursor to the event. Our proprietary joint deconvolution combines the conventional and the mirror migration to provide deghosted broadband data, with a datum at sea level. This joint deconvolution has a unique solution, even when the operators have perfect spectral notches (Soubaras, 2010). No assumption is needed regarding the amplitude spectrum of the reflectivity. Where there is noise in the data, the joint deconvolution can be performed in a least-squares sense and can also be performed in a multichannel manner, making it robust. When processing conventional data, the receiver ghost is combined with the source signature and is moved into the wavelet by designature. When applying designature to BroadSeis data, the receiver ghost is kept separate from the source signature and can therefore be used in processing, before being removed by joint deconvolution. Since the deghosted image uses both the migration and the mirror migration, it benefits from ”fold doubling”, using both primary and ghost events to build the image. Rather than using a linear increase in streamer depth with offset (original slant streamer geometry) CGGVeritas designs a patented custom profile which has the general characteristics of a steeply dipping front section and a gently dipping rear section (Figure 2). This optimized profile provides better receiver ghost diversity, particularly for shallow events in the mute zone, and can be tuned to provide the maximum possible bandwidth for a given geological setting and water depth. BroadSeis builds on the advantages of the Sercel Sentinel® solid streamer with its low-noise characteristics and precise lowfrequency response. The Sentinel streamers can be towed at what are currently considered as extreme depths (up to 50m), in order to benefit from the improved low-frequency response of the hydrophones and reduced sea-state noise, so extending the weather window and reducing operational downtime. As BroadSeis uses only hydrophones there is no increase in susceptibility to noise from steering the streamers, making it fully compatible with 4D monitoring and fanned streamer acquisition, which reduces infill and survey duration. Figure 1. Migrated stack with residual ghost seen as white halo below water bottom (left), Mirror migration with residual primaries pre-cursor (centre) and deghosted result after joint deconvolution (right). Figure 2. Comparison of schematic conventional (left) and variable-depth (right) streamer profiles, and the amplitude spectra (below) which result from the interference from the receiver ghost. “Mirror cables” have been added to the schematic to illustrate the concept that conventional streamer acquisition uses a tuned array with a particular interference pattern (bottom left), the mirror cable representing the recording of the receiver ghost arrival. With variable-depth streamer acquisition, the array is de-tuned with the ghost notch frequency varying with receiver depth. After summing the response along the cable, there is no discrete receiver notch and it is possible to access the full bandwidth. An additional benefit of deeper tow depths is that the noise from the water surface is reduced, which is particularly important for the low frequencies. The flexibility means that the method can be used for a range of applications. The increase in penetration from the extension of the bandwidth at the low end benefits the imaging of deep targets and those below complex overburdens. Shallow targets (such as shallow drilling hazards) benefit from the total bandwidth available and recordable. Usable bandwidths between 2.5 and 160 Hz have been achieved with the technique, and when combined with source deghosting, this has been extended to 200 Hz for 2ms sample interval data, and could be raised still further when recorded with smaller intervals. Since the deghosting is applied after imaging the receiver ghosts have to be preserved through the processing sequence, which can be a constraint for some programs developed for conventional data. Consequently, some modifications have had to be made to some processing steps such as velocity analysis and multiple attenuation applied prior to the final deghosting. Designature is applied for the source-side only, leaving the receiver ghosts for the final joint deconvolution. To enable accurate velocity picking, without the challenge of the receiver ghosts contaminating the data, CGGVeritas has developed intermediate prestack deghosting tools to remove the receiver ghosts prior to velocity analysis (Figure 3). Figure 3. Imaging gathers and velocity semblance before (top) and after (bottom) deghosting. Although some standard demultiple programs, such as Tau-P deconvolution and Shallow Water Demultiple, can be applied directly to variable-depth streamer data, other programs have been adapted to handle variable receiver ghosts, in particular surface-related multiple elimination (SRME). By convolving traces with ghosts, the standard SRME creates multiples with mismatched wavelets. This problem can be partially solved through wavelet adjustment in the common channel (or shot) domain, but standard SRME then leaves significant residual multiples, and the low-frequency multiples are not properly addressed. Therefore, algorithmic modifications were introduced to SRME to improve the multiple model prediction by normalizing the receiver ghosts (Sablon et al, 2011). Figure 4 illustrates the effectiveness of this new SRME technique. The retention of the ghost provides benefits as well as challenges, and new techniques are being developed to use the information in the ghost data, for example in advanced noise attenuation techniques. Figure 4. Variable-depth streamer data benefit from a specialized variant of SRME. These 2D results on mid-offset data demonstrate the uplift from using BroadSeis SRME. The six octaves of bandwidth and increased low-frequency content achieved with variable-depth streamer acquisition result in a sharp, clean wavelet with minimal sidelobes which reduces interpretation confusion, making it easier to resolve events (Figure 5) and interpret fine stratigraphic detail. The increased low-frequency content has a surprisingly powerful effect on the seismic images, providing strong discrimination of layers and highlighting subtle acoustic impedance variations (which are visible on well log data) that may reflect equally subtle facies and fluid effects not revealed by conventional seismic. The subtlety, texture and continuity provided allow interpretation auto-tracking tools to work optimally, with greatly reduced manual intervention, so that data volumes can be interpreted faster and more reliably. Figure 5. Water bottom and near-surface sediments imaged using conventional streamer acquisition (top) and variable-depth streamer acquisition (bottom) in deep water offshore West Africa. The seismic wavelets extracted from the images are overlain on the water bottom reflector for reference. The resolvability of the dipping near-surface reflectors is greatly improved with the deghosted broadband variable-depth streamer data. Data courtesy of Total, the Republic of Gabon and Cobalt. As well as increasing penetration, the extra low frequencies shape the larger-scale impedance variations, providing clear differentiation between sedimentary packages and increasing confidence in correlating interpretation across faults and other major structural features. The increased bandwidth and resolution provide a step-change in seismic stratigraphy allowing increased understanding of lithology and fluid effects in the data (see figure 6). These factors make broadband variable-depth streamer data particularly attractive from an interpretation point of view, as illustrated in the example in Figure 7, which shows a channel feature from the UK Central North Sea. Figure 6. The extra low frequencies provide clear differentiation between sedimentary packages. (Images courtesy of CGGVeritas Data Library). Figure 7. Conventional 3D (left) and variable-depth streamer 3D acquisition (right) images from the UK Central North Sea. The clean broadband wavelet makes it easier to interpret specific horizons and clearly discern closely spaced events such as the top Ekofisk and Tor reflections. In terms of interpreting the channel sands in the central part of the image, the low frequencies clearly map the softer shale horizon (pale grey) containing the sand channel, whilst the incised base and overbank deposits of the channel stand out very clearly on the broadband image. The polarity convention is that an increase in acoustic impedance is represented by a positive black peak. Formation tops are marked on the well on the right hand side of the sections. (Images courtesy of CGGVeritas Data Library). Variable-depth streamer data provide significant benefits for seismic inversion workflows, especially in terms of low-frequency bandwidth extension. The lack of low frequencies in conventional seismic data means that a low-frequency model must be incorporated in the inversion process in order to recover absolute impedance values. Usually, the low-frequency information is obtained by interpolating low-passed filtered impedance logs between well locations, using interpreted horizons as a guide. 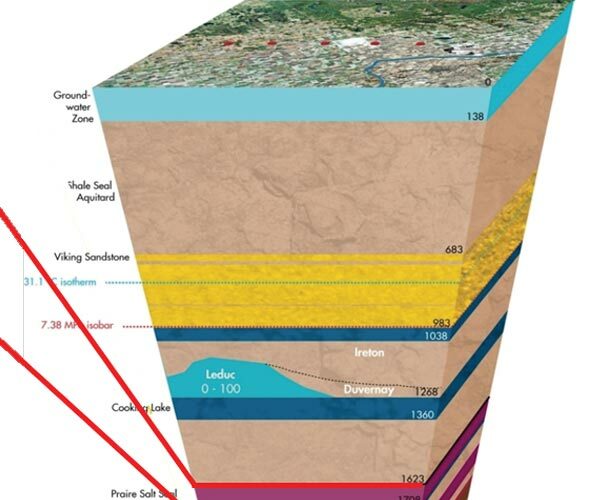 If the wells are sparse and the geology complex, the lowfrequency model derived from the wells may be inaccurate and yield biased inversion results. The typical solution is to use NMO-derived seismic velocities to define the background low-frequency model. However, while the seismic velocities provide information at very low frequencies (~0- 4 Hz), they are not usually suitable to infill the missing frequencies in the range of 4-10 Hz. The ultra-low frequencies provided by BroadSeis enable inversion to be performed without using a logderived low-frequency model and yield accurate impedance and Vp/Vs estimates, even where there is little or no available well data. In the example shown in figure 8, the inversion was performed using only the velocity information, without using any well data in the model; the wells were used only to validate the results after inversion had been performed. The extended bandwidth provided significantly improved inversion results over conventional data, as well as better delineation of the gas-bearing reservoir. The inversion results were also used to perform lithology classification and the BroadSeis results provided reduced uncertainty for facies classification. Figure 8. Prestack inversion of BroadSeis data from Western Australia (below) provides more quantitative estimates of elastic attributes than the conventional data (above). Cascaded lithology classification using the inversion results shows that the BroadSeis data provide a better match with the lithology logs from the wells and reduce uncertainty in the prediction of the gas sands. The BroadSeis variable-depth streamer acquisition technique and new deghosting method yield data characterized by a broad bandwidth (in excess of 6 octaves has been achieved), a clean wavelet with minimal sidelobes and strong low-frequency content (down to 2.5 Hz). It provides low frequencies for imaging deep targets, at the same time as providing high frequencies for detailed resolution of the overburden and nearsurface. 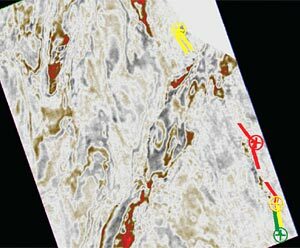 This data makes seismic interpretation more intuitive and detailed by making it easier to resolve events and discriminate layers and subtle variations within layers. With tens of thousands of square kilometers of data acquired to date, in a range of water depths and geological settings, BroadSeis has proved itself to be a robust, efficient and effective solution. In all cases, increases in bandwidth at both low and high frequencies provided significant improvements in imaging and data quality. Inversion results have been shown to benefit from this enhanced bandwidth. In particular, the extreme low frequencies provided by variable-depth streamer data have the potential to fill the usual gap between seismic velocities and the reflectivity to produce more quantitative estimates of reservoir properties and reliable well ties. This enables quantitative inversion to be performed in areas where there is little or no well data available. We thank Total, the Republic of Gabon and Cobalt for permission to show the real data examples from West Africa. We thank CGGVeritas for permission to publish this work and to show the UK Central North Sea and Western Australia data examples. Robert Soubaras received an Engineering Degree in 1984 and a Ph.D. in Signal Processing in 1987, both from Ecole Nationale Supérieure des Télécommunications, Paris, France. He worked at the radar division of Thomson-CSF in Paris for two years before joining CGG (now CGGVeritas) in 1989, where he has conducted various research projects in topics like deconvolution, noise attenuation, multi- component processing, wave-equation migration, velocity model building, broadband acquisition and processing. 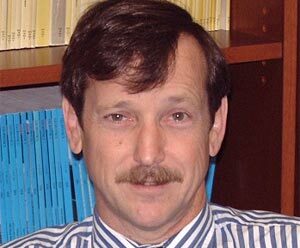 He is presently Chief Scientist in the Processing and Imaging Division, located in Massy, France. Robert Dowle is chief engineer in the Technology Division of CGGVeritas. He graduated from the University of New South Wales, Sydney, Australia, with a degree in Electrical Engineering. He was subsequently awarded a PhD from the same institution for research into high resolution land seismic data acquisition and imaging. Before joining CGGVeritas Robert worked as a professional engineer for BHP Engineering, GEC Marconi, Thales Group, and Sercel, conducting and leading research and development projects in the fields of radar, sonar and geophysical instrumentation design. Current research interests include the optimization of geophysical data acquisition systems, and seismic energy source design. Ronan Sablon graduated from the Ecole Nationale Superieure de Geologie in Nancy, France in 2005. Since joining CGGVeritas as a geophysicist in 2006, Ronan has worked on various projects relating to land, OBC, multicomponent, node and marine data processing. He has been working on BroadSeis projects since CGGVeritas first began developing its marine broadband solution in 2010 and was appointed senior geophysicist & team leader that same year. Robinson, E. A., and S. Treitel, 1964, Principles of digital filtering: Geophysics, 61, 345–404. Soubaras, R., 2010, Deghosting by joint deconvolution of a migration and a mirror migration: 80th Annual International Meeting, SEG, Expanded Abstracts, 3406–3409. Sablon, R. et al. 2011 De-multiple for depth-variant cable data from deep water to shallow water: 81st Annual International Meeting, SEG, Expanded Abstracts, 3505-3509. Soubaras, R., and Lafet, Y.,2011, Variable-depth streamer acquisition: broadband data for imaging and inversion: 81st Annual International Meeting, SEG, Expanded Abstracts, 2364–2368.